From the author of international bestseller The Monk Who Sold His Ferrari comes an inspirational and honest account of how simple changes can transform our lives. Winning starts at your beginning. And your first hours are where the great heroes are made. Own your mornings and you'll master your life. Ever wanted to achieve a greater understanding of how to restore balance in your life? Robin Sharma, one of the world's top leadership and personal-mastery experts, reveals exactly how: wake up early. 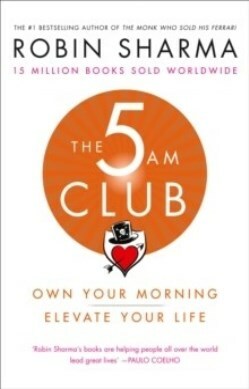 The 5AM Club gives practical and aspirational advice on how to use the most of your morning to unlock your topmost potential. Using real-life examples, Sharma demonstrates how this lifestyle can reduce stress, increase productivity, unleash creativity, improve focus, and most crucially, feel better. Exploring both meditation and mindfulness, The 5AM Club encapsulates the growing movement and ethos which many athletes, performers and CEOs have adopted to achieve success: just one hour can change your life.